Firebug 2 (first alpha) has been released this week and it's time to checkout some of the new features. Note that you need at least Firefox 30 to run it. This brand new version introduces a lot of changes where the most important one is probably the fact that it's based on new Firefox debugging engine known as JSD2. Also Firebug UI has been polished to match Australis theme introduced in Firefox 29. 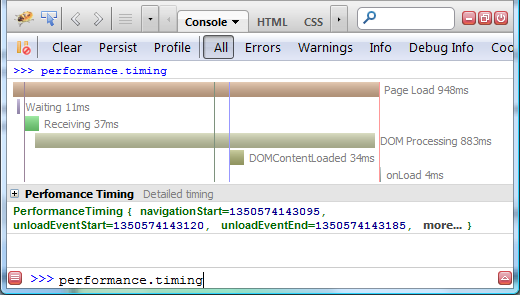 One of the new features introduced in Firebug 1.11 alpha 5 is new waterfall timing graph displayed in Firebug's Console panel and visualizing Navigation Timing data (measured events related to page load performance). You can see the graph if you execute performance.timing expression in Firebug command line. I have recently spent some time hunting down memory leaks in Firebug and the most successful way I have found so far has been analyzing CC (Cycle Collector) object graph - graph of objects that are cycle collected. The particular memory leak I have been looking for is called a zombie compartment. In my case, there is a document living in the memory even if the parent tab has been closed long time ago. Something is still referencing that document object so, it can't be released. The goal here is usually to find that referent. And this is when the CC heap debugging comes to rescue. The rest of this post describes my extension CCDump that allows to dynamically analyze CC object graph. We have been working on version 1.6 since the end of January this year and after twenty alpha releases we have first beta! Firebug 1.7 (alpha) branch has been created and all contributors and active developers are switching to it. Any new ideas and features belongs into this branch. We appreciate feedback from beta users! Please, let us know about any problems in the newsgroup or file a bug (there are Firefox 4.0 known issues). If you are a translator, please help us to get rest of the strings done. Firebug locales are managed on Babelzilla. John J. Barton already put together a list of new features on getfirebug.com blog, but it's too awesome so, let me repeat that and add a little descriptions. Scrolling Panels Tab Bar Do you have a bunch of Firebug extensions installed and there is not enough space for all the panel-tabs? This problem is now solved by scrolling. Command line available on all panels Firebug command line is one of the strongest features and so, it's now possible to use it from any panel. So, for example, you can evaluate an expression while hanging out at a breakpoint in the Script panel. Implemented console.table New method for well known console object that allows to log various data structures using tabular format. Not only the layout is useful, but you can also sort by columns. Disabling break on next error When Firebug debugger hits a debugger; keyword on the page, it breaks the current execution (it works like a breakpoint in the source code). The news is that you can temporarily disable it using disabled breakpoint (a breakpoint with condition set to false). MozAfterPaint events Painting events can be tracked by the Net panel and displayed on the graphical timeline together with all the other events and HTTP requests. Net panel reports BFCache hits In order to make back/forward (BF) browsing and startup fast, Firefox uses a cache (note that it isn't the HTTP cache). Firebug now reports also reads coming from this cache. Option to use en-US locale Firebug UI can be switched into the default en-US locale even if Firefox uses different locale. Useful for developers who use localized Firefox but want Firebug in English. First Run Page A first run page is now displayed after an install or update. We want to keep you updated through this page. Testbot results Results from automated test-bot are continuously displayed on getfirebug.com. Anybody can run automated Firebug test suite and upload results to that page (so we can see that even rare configurations work). Console Filtering The Console panel allows to filter its content using a toolbar buttons. You can filter by: error, warning, info, debug or display all logs at once. We have also fixed many bugs, compatibility issues, memory leaks and I see Firebug 1.6 as the best version ever.